Cullen Omori’s path to his second album The Diet wasn’t an easy one. After the release of his first album, New Misery, he had to deal with busted vans, crashed cars, mangled relationships, and other trials that can leave one feeling like the world is playing a cosmic joke. From the guitar that drops out of the sky on the opening track “Four Years” all the way through the fade-out of kaleidoscopic closer “A Real You,” The Diet is a powerful modern indie-rock album that is buoyed by warped, analog pedals/transistors and tailor-made guitar tones. Omori’s winsome vocals crisscross 70’s art rock and classic songwriting all within the span of 40 minutes. 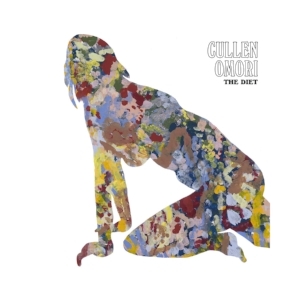 The Diet was recorded with Taylor Locke, who approached Omori after Cullen had played a short acoustic set at Los Angeles’ The Echo—a meeting that made a frustrating night fruitful. “I’m in the patio area, sulking, thinking I just embarrassed myself with a new set of songs that didn’t translate to anyone in the room, and this guy comes up to me and introduces himself,” Omori recalls. “He’s like, ‘I thought the show was great. Would you want to try recording these?’ Something in his demeanor felt confident —I trusted that he got it.” Locke’s talents wound up being well-suited to the intricacies of the songs that would become The Diet. “He can sing, he is a multi-instrumentalist. On top of that, he is also a producer. Working with him really lent itself to my process of songwriting,” says Omori. Omori began working on the album at Velveteen Laboratory, Locke’s studio in Los Feliz, in early 2017. “I wanted to experiment with the structures—having them not be verse-chorus-verse-chorus, having the dynamics not be loud-quiet-loud-quiet,” says Omori. “I like the production because it’s hi-fi and clean, but at the same time we were doing this on our own in Locke’s backyard studio and not in some studio overburdened with the nostalgia of massively successful albums from yesteryear. It was on decent, smart gear, but the DIY aspect comes across in the little imperfections and in the voracious and frantic pace at which we recorded the songs. I think maybe a week after we got the okay from Sub Pop we were working away.” The Diet is lovingly constructed yet not fussy, with Omori’s wail soaring over the latticework guitar of the omnipresent “Master Eyes” and following the vintage humbucker riffing on “Natural Woman.” “I don’t think the record would’ve sounded nearly as good if I didn’t have Taylor record it, and if I didn’t have access to the excellent musicians who played on it,” says Omori. The Diet represents a new chapter for the former Smith Westerns member, one in which he stretches out his songwriting chops and uses his life experience to craft loose-limbed, hook-filled songs that combine pop appeal with finely sutured lyrics. “Not so much a reinvention, but a different approach to a problem I struggled with on New Misery: how to synthesize all my influences into something that is representative of what I want to hear as a musician, and what I want to say as a songwriter. I spent my early 20’s saddled with the ill-conceived, romantic notion that the best songs are written through suffering. And finally, whether intentionally or subconsciously, when I came across the truly painful events of the past couple years they reinforced my personality as a songwriter. I think this couldn’t be truer than when, thanks to my quest for ‘true experiences,’ I was sitting in a hospital detox center facing out on Lake Michigan in Chicago and literally just a few miles south, Lollapalooza, an event I’ve played twice and had many peers at, was happening without me. The process of trying out a completely different persona and approach in New Misery, and then facing my negative experiences and the shortcomings of that persona, to clarify where I wanted my music to go. While making The Diet, my songs were constantly presenting themselves to me, and when I got a chance to listen back and read my song journals I saw what a truly beneficial and cathartic event had taken place.” The Diet’s collection of 12 songs has Omori well on his way.